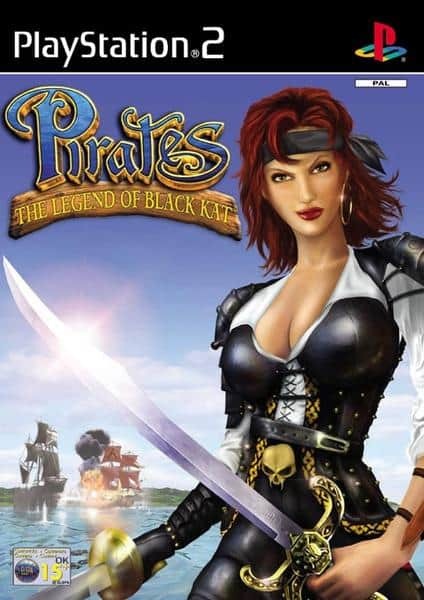 By chance I found this old PlayStation 2 game, it’s Pirates: The Legend of Black Kat. Kat stands for Katerina, not cat. The story starts with a big mystery, not because of flashback or other suspense, it’s just because I don’t understand anything what’s going on. There’s a video where a pirate tells a story to a little girl and then… you’re controlling a ship, without any tutorial, come on, sink the enemy! After sinking the enemy without even a reason (what if they were good people? ), there’s another video: someone is dueling with somebody else, talking on the classic lines of “you have to walk over my dead body”, getting his wish fulfilled. Our hero, after sinking a random ship, sees some black smoke from far away: “hey, maybe my father is in danger!”. She runs back home and everything is on fire! And her father has been killed! Luckily he wrote a long letter with the explanation! But if he had all this energy to write a full page with a quill, couldn’t he try to escape? And the bad guy, that was giving fire to all corners of the villa, didn’t notice that his victim was writing a book? From the letter we get a shocking news! Katerina’s mom was a pirate. I would never imagine that! So starts her revenge: time to get back to the ship, moored on the other side of the island, of course. You have to kill all the enemies on the road: pirates wearing the same outfit, giant crabs and, if we enable a teleport to an “underworld” like in Stranger Things, we’ll meet also skeletons. Here also no tutorial, good, we’ll learn the buttons in the hard way! There’s no violence, defeated enemies disappear immediately and become gold or powerup. This “underworld” stuff doesn’t make sense, at least at the beginning of the game… maybe it will make sense later in the game? Something interesting is that Kat can “smell gold” like Scrooge Mc Duck: when you walk over a treasure, the controller starts to vibrate and she says “I smell gold”. If you want to take it you have to walk around pressing L2. It doesn’t always work: when I was in the “underworld” she kept telling me for 5 minutes that she was “smelling gold”, but I didn’t found anything. What’s the purpose of this gold, I don’t know yet, maybe later in the story we’ll find a store or something like that. When you have killed everyone and arrived to the ship, you get the tutorial. Why???? Why after 25 minutes of play you put 30 pages of tutorial???? I already got the commands at that time! When you are nearby to the water, a force field will stop you, you can’t jump into it: this saved the developers from unnecessary programming complications. Another thing that we are not be used anymore is that you can only save when you find a save point (a parrot), no checkpoints or automatic saves. When you get in the boat, there’s the second game mechanic: sea navigation and cannon shooting. After all, if you ignore the bland story, it’s a good game: adventure, exploration, sea fights: you would be curious to see what’s in the next island. Another extra point to the player vs player mode: who loses gets a more powerful ship. So, if you play against a friend who has never touched the game before, the game automatically balances the fight! Great! Graphics and sound are obviously outdated, but if you consider that it’s a game published in 2002, it’s great: for example the water is transparent, with fishes and sunken ships, on sand you leave footprints and monkeys are playing cheerfully.